We are absolutely thrilled to publish our interview with Murray Carter from Carter Cutlery who was asked to take the position of number seventeen in the Sakemoto family tradition of Yoshimoto bladesmithing. Murray believes the he is the only Caucasian ever to have had the honor and privilege of this position. 1. You started your journey with knives in Japan at a very young age. Can you tell us a little more about it? When I was 15 and in high school, I started the study of Karate. I became very interested in all things Japanese and eventually travelled there when I was 18 to get some further instruction at the karate headquarters in Kumamoto. On my second day in Kumamoto, I had a fateful chance encounter with 16th generation Yoshimoto Bladesmith, Mr. Yasuyuki Sakemoto. The rest, as they say, is history. 2. Did you develop your own, unique style or you are strictly working with the Yoshimoto bladesmithing technique? As much as I try to honor and preserve 16 generations of family bladesmithing heritage, one can’t help but develop one’s own style after forging and completing nearly 25,000 blades over 27 years. The basics of fit, finish, symmetry, blade geometry and metallurgy must always be strictly adhered too though. Without those, personal style just becomes an excuse for poor bladesmithing. 3. What is the difference between Japanese and American bladesmithing ? 4. What are your biggest values when it comes to bladesmithing? 5. It is a simple question, but having such a long and wonderful way to become mastersmith and the seventeenth in the Sakemoto family tradition of Yoshimoto bladesmithing, what is a knife to you? A knife that I forge with my own hands has a very deep and profound meaning to me. It symbolizes the victory of mature confidence over childhood insecurity. It symbolizes the persistence and dedication it required to master the craft. It represents livelihood for my wife and children. It represents the accomplishment of dreams and life-long goals. It represents success in both a spiritual and worldly way. 6. In the above video, Mr. Sakemoto said that your skills are way more advanced than his. Do you agree with that and do you believe that every generation can or should be better than previous one? I do agree with Mr. Sakemoto that my bladesmithing skills have eclipsed his own. That is mainly because when I accepted the title of 17th generation Yoshimoto Bladesmith, he retired to pursue his life-long dream of photography. If his dream had been to be the worlds greatest Bladesmith, I’m sure I would have never caught up to him! As far as patience, wisdom and understanding go, he will always be several steps ahead of me, I’m sure! 7. Your are number seventeen in the Sakemoto family tradition of Yoshimoto bladesmithing, which is a great honor and responsibility. 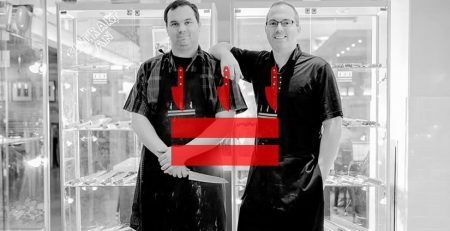 Have you found someone who could be the 18th generation Yoshimoto bladesmith? I currently have three very capable and enthusiastic Bladesmiths, whom I have trained who work directly under my supervision. It is quite probable that one of them, or a future apprentice Bladesmith, will become number 18 in a long line of Yoshimoto bladesmiths. I always have my eye open for the best person for the job. 8. Do you plan to expand your business or you do prefer to stick to the values and do what you love avoiding the ‘commercial world’? There is no way to be a professional Bladesmith and “avoid the commercial world”. We sell what we make to earn a living. Carter Cutlery supports 10 households. The way we comfort ourselves in charging money for our knives is to provide blades that consistently surpass the customer’s needs and expectations at any price. We are also dedicated to our customer’s satisfaction with honest after sales service. We take pride in the fact that a very high percentage of our sales are to repeat customers. 9. Would you change anything in your career/life if you would have a chance? I don’t think it is too helpful to dwell on what we could have done different in life if “we had only known better”. I personally was born into this life with some pretty heavy chips stacked against me, and have been very lucky to have made it to where I am today. We can’t go back and change the past, but we can control over what we do today and hopefully tomorrow. Each day I just try to make the wisest and most compassionate decisions possible so that in the future I won’t look back and regret the present. 10. 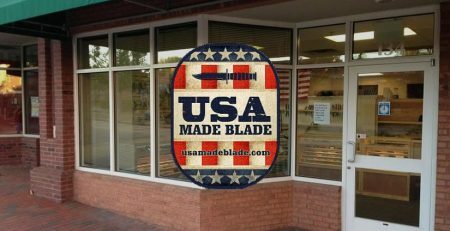 Do you have any advise for knife makers in USA or from anywhere else in the world ? My advise for anyone is to learn from the best and brightest in any industry; to work not only hard at what they do, but to work smart as well. Make good plans, short term and long term, and stick to those plans. Concentrate on the immediate task at hand and do it to your greatest ability. Take care of your physical and mental health and be sure to never put work before family. Thank you Murray for your time and for telling us more about You and the tradition of Yoshimoto bladesmithing as your story is inspirational for many people. I’m sure that it will help many of them to follow their dreams. This was interesting to me. I just grab a knife and use it as long as it cuts. I never knew it was so intricate. The fact that two cultures have a different philosophy shows how intense blade making is. The Japan culture takes it to the next level. Thanks for sharing this information. I was also amazed and intrigued by Murray’s story and I’m very happy for him that he achieved so much in bladesmithing. We need more people like him these days. I’m also happy that you can see now, that there is so much behind a good knife. I learned a lot from this interview. It takes time to master a craft and the past should not be carried into the future. I learned both of these the hard way. I’m glad to hear that and I absolutely agree with you. It’s a very inspirational interview.